"This project contains members of Leather Hyman and W.A.C.O., along with three Theremin and sampled dialog from Planet Of The Apes films. It is both a satire of rock music and a Swiftian essay on the nature of power and control found in same. Actors from Planet Of the Apes films frequently perform, in costume, with this group, who manage to draw hundreds of people to each of their shows. 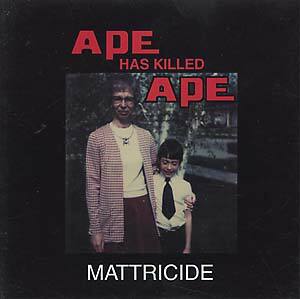 The front cover shows Leather Hyman drummer Matt Stein with his mother (Mattricide -- get it?) and frying on LSD at school marching band practice, age 14, on the back."